“All blue people are assholes”, Professor Peter De Prins started, “blue people want change with targets. It needs to be measured or otherwise you cannot get them on board”. After we just filled in the change color self-test, I take a look into the classroom to catch reactions. The body language of some participants gave an idea about their internal reflexions. Of course, Professor De Prins wasn’t serious about it (at least I hope so because I scored blue for doing and red for thinking). He just wanted to make a statement and wake up the group. People are different and your change management approach should take this into account. There is no one change approach for changing your organisation. While you can motivate some with numbers, others need (to be in) a guiding coalition. 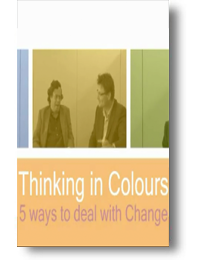 De Caluwé & Vermaak offer a framework for this: the ‘colors of change’ or also known as the ‘change color theory’. These change paradigms offer insight on how people perceive and deal with change. Like they say: each person has his buttons and you need to know them to be able to push them. Yellow – based on social-political and power play. Change is a negotiation process. Blue – rational design and implementation of change. A lot of tools and processes are used. Blue people set targets for and try to control change. Red – set up HR systems for reward and punishment. Red people rely on social events and team building. Green – change and learning are closely linked. Set up learning situations and feedback. White – chaos and complexity. No path determined on beforehand. After I was taught the theory and with the benefit of hindsight it was easy to reflect upon previous change projects and see the causes for success and failure. In previous change project there was almost always one color left out. This resulted in not addressing one target group. For example, while we did tune our message for rational and emotional people, other groups were left out. How are you doing? And thinking? Do you know how you are doing change and thinking about how change needs to be done? De Caluwé & Vermaak offer a self test here. Small remark: it’s perfectly normal that there’s a difference in the way you’re doing change and how you think it needs to be done. Which is the best/worst color type? As with many personality tests (eg. MBTI, Belbin) there’s more value into knowing which type you are, rather than for selecting ‘the best type’. As mentioned above, I got different results for thinking and doing. And after some reflexion I know that in stressful situations I’m pushed into blue thinking, so for me the challenge first being aware of this and next addressing the other types of people in my communication and change management approach. Make sure you check our their video material, also available as playlist on YouTube. Why are we so afraid of coloring red regarding metrics and KPIs? Red is only an interpretation. Already starting from a very young age we are confronted with performing. Bad grades are marked with red and are discussed with your parents. Performance is being build in. The nature (or strength) of some among us is rather achievement oriented or even competitive. We want to be the first, be the best. Another pitfall could be perfectionism. Errors, deviations, unexpected results, … are not wanted. Coloring red can be confronting: it shows there are problems. Red colored Key Performance Indicators (KPIs) do indicate problems, but they also are indicators for opportunities for improvement. So red is not only an interpretation, but also an opportunity. The are various problem solving techniques available to take a look at the problem: Root Cause Analysis, Brainstorming, Reduction, 8D, Value Stream Mapping, GROW, … With these techniques you can identify the root cause, find a creative solution and implement the solution. So red is not only an interpretation and an opportunity, but also a road to change! To follow the PDCA (Plan-Do-Check-Act) cycle (or the “Deming wheel”), the next reporting period you can check the result of your actions. Is the KPI still coloring red? Let’s investigate again. If it is colored green, then you can check where the next focus can be set. So red is not only an interpretation, an opportunity, a road to change, but can also (re)set focus! To summarize, metrics coloring red are not bad, they provide us opportunities for change and improvements, opportunities to set focus and rethink the process. Red is not bad, red is good. Red is the new green! So what about those green metrics? If red is not bad, what’s the meaning of coloring green? Targets are made… too easy. You are using the wrong metrics. Management (or the KPI owner) does not see problems. If you whole KPI dashboard is coloring green, why are you having a KPI dashboard? Why are you spending time to set it up and discuss it? Is it to be complacent? To follow a process? When all KPIs are coloring green, an alarm bell should go off. The team is not going the extra mile, the targets are made too easy, the management is in a luxury position and doesn’t see problems, and so on. So green’s not that good after all.